Excellent quality, really love it! 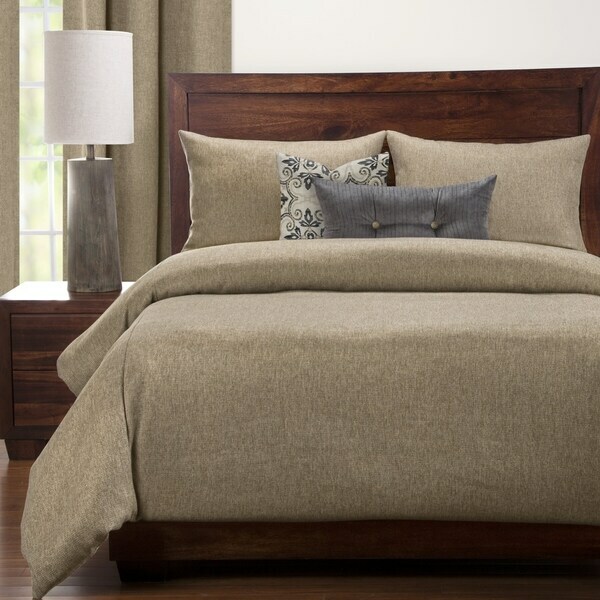 With the look of a high end fiber but more functional and durable, this beautiful Siscovers Harbour Sand Duvet Cover Set features an inventive polyester construction for luxurious comfort that will last for years. This luxury set features toss pillows in a French script and a velour textured solid as well as a duvet cover backed with an ultra-soft sheeting material that pairs maximum comfort with style. The duvet cover and shams have zipper closures for easy cleaning, and the eco-friendly down alternative duvet insert buttons in 8 places to ensure it does not shift in the cover. Stuffed with a medium-weight fill made from recycled plastic bottles, this cozy duvet set benefits your health and the environment when compared to natural down. The ultra-soft white polyester cover on this eco-friendly duvet insert cleans in the washing machine, making maintenance easy. This luxurious duvet insert is designed to keep you warm all year round. This duvet set really adds that rich expensive look to my bedroom. The quality of all pieces exceeded my expectations. Especially like having the alternative comforter enclosed in duvet cover, ends that constant battle of trying to keep comforter in the duvet cover. Great buy! I love the color and texture of the fabric. Extremely versatile and surprisingly durable. I thought it would snag easily but my 90 lb dog has sneaked a nap on it and it still looks great. Duvet insert is thicker than expected but not as thick as a down comforter insert. I would buy again. This went beyond my expectations. It is even better in person than the pictures and I am so pleased with how soft it is -- was not expecting that. I purchased the Cal King for my Cal King and it is large enough to drape down to my platform bed. Some Cal King covers are short but this is definitely large enough. Would recommend to anyone. This is a beautiful duvet set. It is the texture that drew me. Well made. However, I did purchase the king for the queen size bed I’m using it on. Fits perfectly. This is such a great quality and weight! Very luxurious, but it is woven so you need to be careful if you have pets that like to jump on the bed, as their claws (especially dogs) will pull the fabric. Otherwise, it is exceptionally nice, I have this set in our mother-in-law suite and it pulls the room together perfectly. Love it, much softer than I thought. Duvet itself is very heavy and well made, will keep you very warm on cold days!! Love the look feel and weight of this. It’s beautiful. Great value! Color was as expected. Good quality. "Does this have any gray undertones or is it mainly a tan/beige?" It is mostly a warm tan/ brown tone.